Six months after the arrival of Cassini-Huygens at Saturn, mission scientists are gearing up for a new phase. Like a Christmas present tumbling from Santa’s sleigh, the European Huygens probe will be cut loose from the orbiter on 25 December, before diving into Titan’s atmosphere 3 weeks later. Huygens is expected to improve our understanding of Saturn’s largest moon, the only one in the Solar System known to have a dense atmosphere containing organic molecules. Another tantalizing question is: Could Titan tell us how life appeared on Earth? Since entering orbit around Saturn on 1 July, Cassini-Huygens has already made many discoveries. Its 1st pictures of Saturn’s rings revealed an extraordinary world. Indeed, some were so unexpected that observers could be excused for thinking they were hoaxes. A young planetologist has also found 2 new moons, chalking up a major success for the French scientific community, which is the best represented on the mission after the U.S. teams. Cassini completed its 1st flyby of Titan on 26 October, swooping down to within 1,200 km. Pictures from the imaging camera and Visual and Infrared Mapping spectrometer (VIMS) unveiled Titan’s surface in unprecedented detail. Cassini’s radar was also able to see through the thick haze clouding the moon’s surface. And the results are surprising. For the time being, scientists admit they are not yet sure about what they are seeing. However, one thing is certain: the fact that there are few impact craters suggests Titan’s surface is young and shaped by recent active processes. 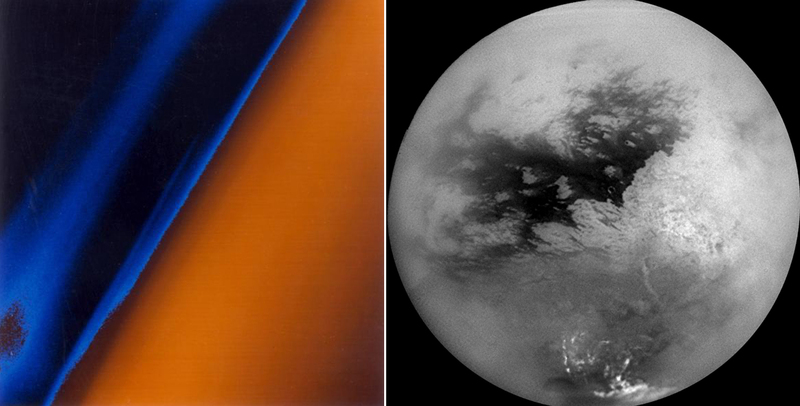 On the left: Titan’s atmosphere viewed by Voyager 2 in 1981. The flyby was unable to reveal any surface features. On the right: Titan viewed by Cassini’s imaging camera during the flyby on 26 October, at a wavelength to which the moon’s atmosphere is transparent. White patches at the bottom of the image are methane clouds. The exact nature of the dark and light areas is not yet understood. The lack of impact craters indicates that Titan’s surface may have been shaped by low-temperature volcanic activity (cryovolcanism). In all, 44 flybys of Titan are planned during the mission. The 2nd took place on 13 December. A major goal of this latest flyby was to measure the thickness of Titan’s atmosphere, in order to determine whether Cassini can safely get closer to Titan on subsequent flybys, and to verify that Huygens’ atmosphere models are correct in readiness for the probe’s descent on 14 January. Observing Titan remotely is one thing, but mission scientists would like to take a closer look. The European Huygens probe riding piggyback on Cassini will be released on 25 December. After coasting toward Titan on a ballistic trajectory for nearly 3 weeks, the probe will dive into its thick atmosphere at a speed of 20,000 km per hour. Several parachutes will slow Huygens’ descent, the 1st opening at 180 km from the surface. 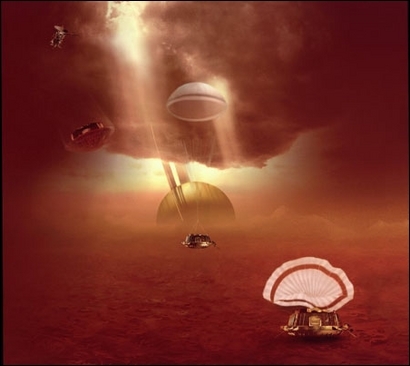 In the space of a few hours, Huygens will experience extreme temperatures swings, going from 12,000°C as it is heated by friction against Titan’s atmosphere to –200°C on arrival. The parachute descent is expected to last about 2h 15 min., during which the probe’s instruments will acquire in-situ measurements of the atmosphere’s composition, looking for carbon and nitrogen molecules, as well as aerosols. Data collected will include details of the probe’s trajectory to determine wind speed, surface types (solid or liquid) and roughness, images of the surface, and indications about the atmosphere’s transparency. A pair of instruments—one under the responsibility of a French principal investigator—will analyse the atmosphere’s chemical make-up and structure.